Save me! My sd card in Amplifi 75 has died and I couldn't find image! I would be highly appreciate if someone can share it with me. Maybe link on official site or if you keep it somewhere in cloud! interesting.. if the OS is contained on an SD Card (My Brand new AMPLIFI 75 doesnt work at all) then I might have a simple fix. I can almost bet that even if it were that simple, we would be sent to a repair centre and not be allowed to make any fixes at this level though.. So inside the Amplifi 75 there is a MicroSD Card. It is held in there with a blob of glue. @Ilya.. do you know what is on that card? is it the OS? I asked Line6 in my support ticket but they ignored the question. If these devices are starting to become obsolete / legacy, it may be time for some community based resources to bring them back to life. Hey guys! I've read a lot about problems with Amplifi 75 etc. I really love this amp and felt upset that it is not working properly now. 1) Ihave measured all voltages from power supply and it seems well. +19, -19, +8.11V. 19 volts for speakers and 8V for logic board. 3) there is no problem to remove glue. I just cut it with knife between metal case and sd card and easily remove it. 4) sd card has raw system so it is not fat or ntfs or Any other. It is byte by byte cloning. 5) what problem I have? Well when I switch on I can play for sometime 30-40min. If I change preset by phone than it reboot and 4 leds flashing. Then i need to leave it for some hours before it can work again. Usually it can be related to capacitors but all of them looks fine. Maybe later i will check them. Also if i play and change volume than speakers start screaming like a hell that my heart start beating 150bpm. So lets together find the solution coz line6 themselves doesn't help at all. have you tried firmware updates, even if on the current one? It may take away an issue. depending on where you are, you can buy boards from a place called full compass, though they apparently dont ship outside US. might be an option to just try replacing boards... doesnt help me in Australia.! would I be able to get a copy of the sd card image? I want to do some analysis on it, and be good to have a problematic one, plus a good one to see if I can identify where the problems lie. I thought about buying on full compass replacements but they dont deliver to Russia. I will send u image of my original sd card. Yes i've tried updates starting from 2.00 up to 2.6.still all leds flashing. There is aleroux guy who did make an image clone from the new mainboard be ordered for replacement. I've asked him to share with so waiting for reply. How would you make analys? Coz it just a raw data? the data must have some structure. it is either important to the unit starting and working properly, or it is not.. that needs to be determined. If it is the "OS" of the unit, it will be an embedded filesystem or such, which I have analysed many types before. It may just hold settings. In your case, it seems more like an electronics problem. I wonder if the problems we see here are just a very small amount of units, and thousands are sold that are fine.. it would be good to know how many they have sold.. not useful in our case but just out of interest. Intriguing subject, especially in light of a thread I read some time ago wherein a user suggests that a trashed or faulty SD card may lie at the heart of a lot of seemingly-bricked Amplifi devices that won't reset, won't boot or won't update. It may just be anecdotal evidence, but it's worth some investigation, in my opinion. If the SD card doesn't have an identifiable file system, how does one read and write to it, in order to 'study' or duplicate the contents. Is there model-specific information in the SD card image, or is the same data set used for all the Amplifi devices. To create a disk image, there are a variety of different ways. I will take it from the top (pun intended!) assuming varying levels of experience mucking about with files/disks/images/OS's etc. It is a very easy process. 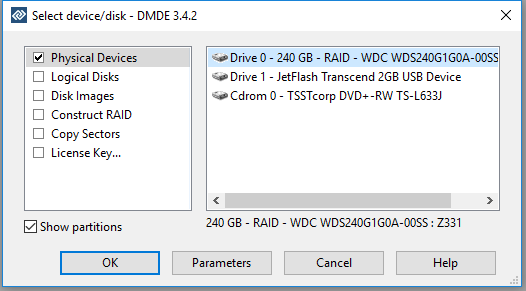 you can use dd in Linux, but I choose the DMDE. http://dmde.com/download.html I bought the pro version to use with data recovery but the free version will allow you to do everything just fine. I am going to go through it verbosely, but it is easier than it looks. insert microsd in whatever reader you need to in your PC. It must be said that opening your amplifi and removing MicroSD card may void your warranty. It is debatable with this unit if it is user serviceable or not, as most musicians I know extensively get down and dirty with their gear, and removing a microSD is not very technically challenging. Also, Amps get hot, and I am not sure how the Amplifi is on the mainboard, so it may not be the best idea to put hot glue when you install card back in. it might pay to find some heat resistant silicon or look in an electronics shop for a suitable product to reglue it. 1. Install DMDE or use portable version, insert card, then open DMDE. you are presented with a list of Disks in your PC. 2. Double-click your card. It will scan for partitions. 3. It will look something like this (I am not doing an Amplifi MicroSD in this example, but a USB drive. 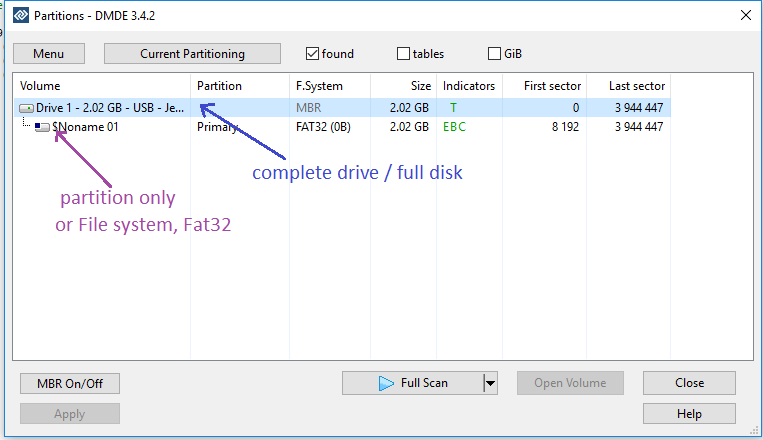 It should be similar) It shows the disk, and any partitions. 4. right click the disk and choose to clone it. 5. for destination choose "file"
6. Choose a filename. 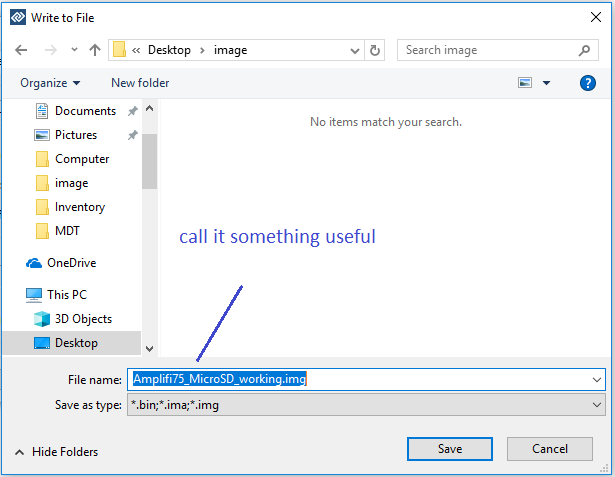 I use a .img extension to denote disk image. .bin is fine as well. call it something useful in case you are going to have multiple images. You might want to add the date, if unit working or not, or version of firmware etc. 9. finished, the result is a disk image of the card. 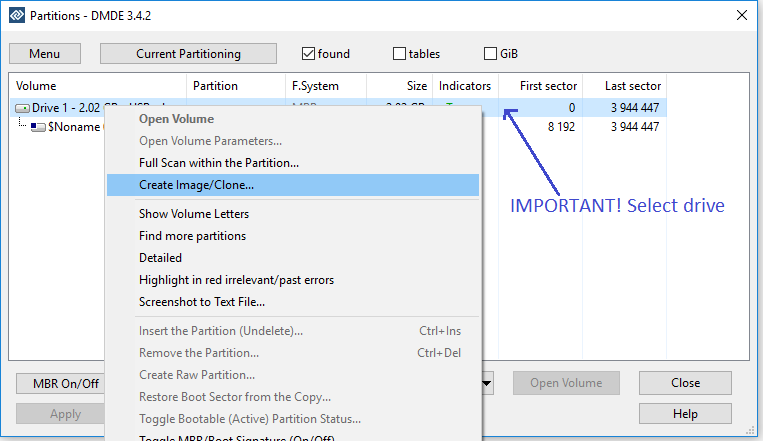 If partitions are ok, or screwed up, you still have a complete copy of the card. 10. now you can analyse the disk image to your hearts content. tolls like HxD (Hex editor) will allow you to scroll through looking for clues. 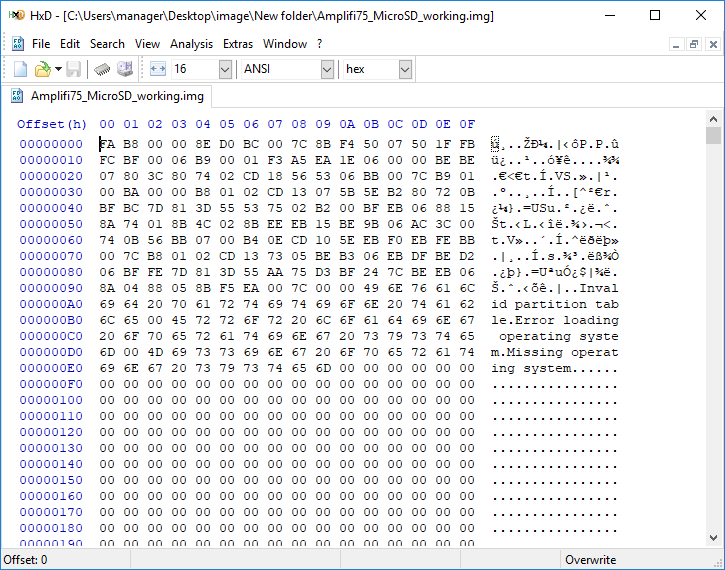 Other more advanced tools like binwalk can be used to extract files from embedded filesystems, identify files, and gather quite a bit of info on what you have. IF it is a semi-standard sort of system/storage. At the very least you will get some idea if the MicroSD card is important or not. 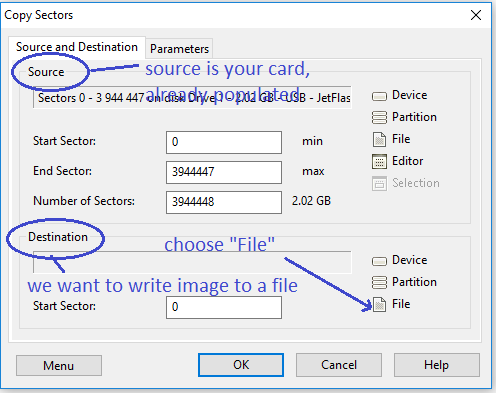 you can use similar steps to clone a card to another card as well by inserting in your PC a second card and instead of cloning to a file, clone to the 2nd card. you need to make sure specs are the same as memory cards may be slightly different sizes even if both say 2GB for example. Thanks for the information and suggestions! I've saved your post to a pdf, just in case it 'disappears' from this thread. At this point, any such investigation is kinda low on my priorities list, but I'll keep you apprised of any future developments from my end. After weeks of trying to get word from Line6 /Yamaha/retailer on how to get my Amplifi75 working or replaced, I finally got it dropped of to a repair guy near me. I do have an image to look at.. same issue, no time right now! Good luck, mate! Hope you get your Amplifi fixed-up and love it when you finally get to play with it! Just found the problem with the Amplifi 75 booting up problem. It's a simple error since the batch of SDCards used are damaged. The proof I included in this message and I trust the moderator will pass it on. So what happened: I think the early batch is installed with faulty SDCARD of the brand SANDISK 4 GB - speed type 4. The picture clearly shows you that the card was getting much to HOT and cracked in 2 pieces. This crack explains why the Amplifi is showing solid 4 leds and dim BT. 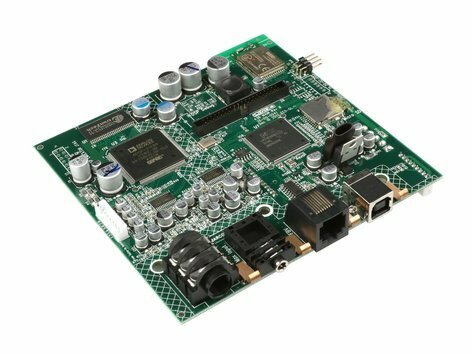 The NXP processor chip on the logic board is simply getting no instructions to boot and thus the unit is completely dead. Next to this the analog devices audio circuit will not function since the CPU is dead! Ok ……. how to fix this??? For me: I have only 1x Line 6-Amplifi 75 -> I need your help!!!!!!!!!!!!!! Who is willing to copy his/her's SDCARD and share the image with me? After testing I will send you a full manual how to fix and trust I will be helping many of you. So if you have a working Amplifi 75 please open the unit (6 screws). Remove the glue gentle from the SDCARD holder. The glue is rubber type and easy removable. Then push the SDCARD in the slot and release. The last part is helping the SDCARD to come out of the holder completely. Please use the software programm to copy the content of the SDCARD as mentioned above. This file is what we need to get it fixed and can be shared via google drive/ onedrive and others. You’re in luck. Two weeks ago picked up 4 of these new in box from a dealer trying to get rid of them cheap. Cheap enough that the ones I don’t use as amps will make good Bluetooth speakers around the house. It only took a few days for the first one to lock up and fail. I cracked it open and my eyes immediately zeroed in on the fact that there is an SD card. As an IT engineer, I knew that this was more than likely my issue. I jumped online to see if I could find a quick fix and found this thread. Anyway, I removed the card, but there isn’t any physical damage. Just likely a corrupted SD. I then grabbed a unit that has only been updated, but not used beyond that. I pulled the good SD card from the working unit and put it into the failed unit. Yes. It now boots up and works correctly. It’ll be a couple days before I can create an SD card image, but I will let you know something as soon as I do. I got the same problem. You'll be doing a great job. It will save many guys here. Ok, so here it is. 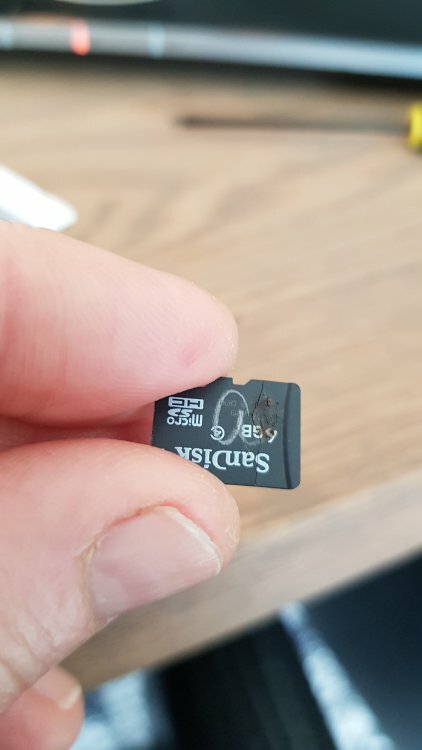 This is a 4Gb SD card image pulled from an Amplifi75 running firmware 2.60. USE AT YOUR OWN RISK!! -I used the Mac SD image tool, Apple Pi-Baker, to read/write the image with no issues whatsoever. Pretty simple to use. I'm sure that tools like Etcher or Win32DiskImager will work on the Windows side. Not going to get into all that. Any SD tool that can work with .img files should be ok. I replaced 4 cards for all of my amps and all copies worked. -4Gb SD cards are no longer available at my local MicroCenter. I had to settle for 16Gb MicroCenter branded cards. At $2.99 ea, why not. I've used these cards in a lot of Pi projects with no problems. Rock solid. But this is a 4Gb image, so yeah, after imaging the 16Gb card, 12Gb is left on the table. It wasn't a problem. But don't expect an upgrade to the amp for using a larger card. On that note, make sure you use at least a 4Gb. 2Gb cards will obviously not work. -Current Firmware- I did run into trouble on the two amps I had not opened yet. They were fresh from the box and still running 1.00 firmware. They would not boot from this image. I had to upgrade them to 2.60 first, and then they worked fine with the replacement SD card. Had I been smarter about it, I would have captured an image from the 1.00 SD card before upgrading. That is my fault. So my guess is that you might need to be on at least firmware 2 for this to work. But 2.60 is all I can confirm. Here is a Gogle Drive link to the file. Hopefully it holds up. If not, I'll have to find somewhere else to host it. I also hope I do not get asked to pull it. The file is only of use to us with Line 6 amps having problems. Please share your experiences with us. Our fix was working within 15 minutes and we're ready to rock and roll again. Plug in the SDCard and do not format the fresh SDCARD!! Close this dialog box by clicking on ‘Cancel’. Then click on ‘Drive’ in the menu and select the ‘Open Image’ IMG file to load onto the SDCard. After opening the IMG file please select ‘Phsysical Devices’ and select your SDCard and start the process. Wait +/- 5 minutes to complete. 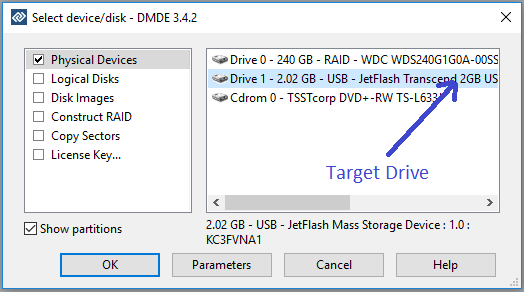 The DMDE software will copy bit-by-bit so the size of the SDCard isn’t that important. Feel free to use 4 GB/ 8 GB/ 16 GB SDHC SDCard speed 4 or higher. The IMG for all Amplifi amps are the same and I have tested the 150 image on my Amplifi 75. The only difference is the speaker amp circuit and size of the guitar loudspeaker. Plug the SDCard in the slot of the Amplifi 30/ 75/ 150 or TT and it will run. Get the Bluetooth link working with your device and Line 6 Remote App and give it a try! I did exactly as you said, but still have my Amplifi 75 (2.60) in recovery mode on boot with 4 flashing lights. I tried Apple Pi-Baker, Etcher, DMDE on Mac and DMDE for Win64, then updated firmware via Mac or PC many times and got the same result. I could get the bluetooth link and start update procedure via Line 6 Remote App but it freezes again and again. I have fixed one Amplifi board by replacing the RAM. I thought first about the SDCard but that did not solve the problem. from the power supply were OK. In fact, the memory chip was hot burning when I touched it. This was not easy to change as it is a SMD chip. But that worked ! The chip is a Etron Tech EM638165TS-6G . I bought it on Ebay. Of course that was risky, last call operation. As I am not equipped for SMD (no hot air gun) I had to cut one by one all the pins. Then clean the board with copper mesh. And finally reinstall the new ram. I would not do it twice without proper equipment. By the way, I had to buy more than one chip. Two more are available if you want to try or better if you have a friend well equipped.